It’s time to kick off 2019 with another edition of Quaker Concern, CFSC’s 8 page print and digital newsletter. 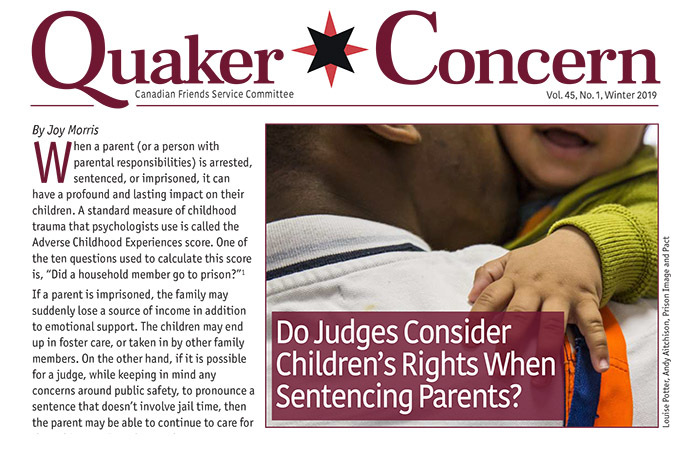 In this issue Joy Morris sheds some light on how Canada may be failing children when their parents come into conflict with the law. Do Judges Consider Children’s Rights When Sentencing Parents? And as always, we share some brief highlights from CFSC’s work and recent travels in support of justice and peace. 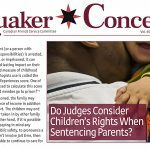 All donors to CFSC receive a print copy of Quaker Concern FREE. Donate now to get yours.